Color is so funny. You never know how it will come together. 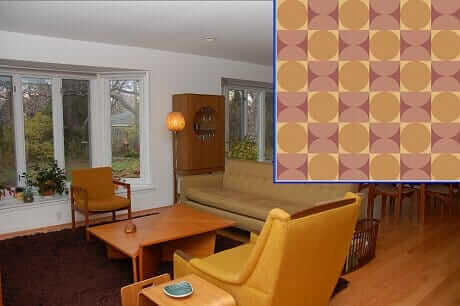 After researching Rebecca examples of how to complement orange with blue and green for Rebecca and Keith’s 1961 mid-century split level house, I started poking around Bradbury’s Mod Generation wallpaper to see if they had any designs and color palette that might work for her rooms. I put this “Reverb” in “Purple Tangerine” up next to her living room and woah mama, I like it. A lot. I never would have thought of putting these colors together — proof that you gotta search and scope and throw samples up on the wall. This wallpaper works beautifully with Rachel’s mid-century sofa and chairs…the lavendar brings in an accent color…the print is sophisticated…and bonus: the round detail is echoed in the glass inset on the door of the teak china hutch. Rachel, I think that you could put this along one long wall (the back wall?) of the room, then pick up the lightest butterscotch-gold in the wallpaper for the rest of the walls, and it could look fantastic. All that said, (1) you gotta put the wallpaper sample up and see that it really looks good in real life, including that the scale is right; and (2) color is very very infinitely personal. Colors are vibrational waves. You are made of electrons that are also vibrational. How the two synch up — very personal.